And, yep, it’s all totally healthy — as well as dairy-free, gluten-free and grain-free. Plus, it’s totally delicious. Basically, you supply the protein and greens, and we’ve got all the dressings/marinades and condiments to make it a tasty party! Another awesome thing: This giveaway is open to readers in both the U.S. and Canada! 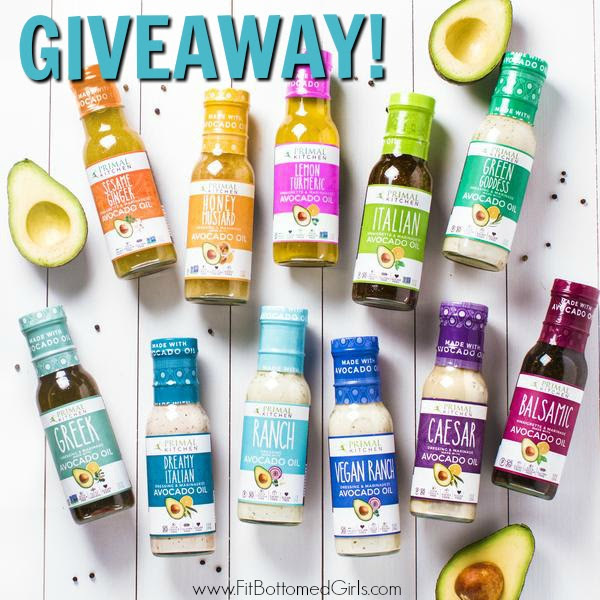 All you have to do to enter to win is follow us (@FitBottomedGirl) and @PrimalKitchenFoods on Instagram, and then leave a comment below with how you’d like to enjoy these goodies. (The Primal Kitchen blog has tons of recipe ideas if you need inspiration here.) In about a week, we’ll select a random winner and announce him/her in the comments and directly via email. I’d use these to make chicken Cesar lettuce wraps that my peanut and milk allergic kiddo could have! I’d enjoy some pretzels in the honey mustard and want to try lots of yummy flavored salads! :3 <3 Ty! salads, quesadillas, turkey wraps, chicken! really anything. i love dressings so much. i followed both pages under the instagram i linked in my comment. I’m dreaming up all the ways I can marinade meat or dress up a salad with these! They’re so versatile! Follow you both on IG as susitravl. I would love to enjoy this in bean salads with all my friends over. So many ideas going through my head its making me hungry. I’d use these on top of a fresh garden salad. Refreshing salads with friends and family. I love primal kitchen!! Their dressings are delicious on salads and serve as yummy marinades for meats all year long. I would love to enjoy these goodies by throwing a BBQ party for my friends on Labor Day! Thank you!! I would love to have a chance to use these to make delicious meals! I just found these last week and it has taken my usual lunch salad up a notch. Would love to try ‘em all to help me up my veggie intake with a healthy flavour boost. Just discovered the ranch one last week and loving it on my lunch salad. Would use these to help me increase my veggie intake with extra flavour boost! These would be my go-to for salads! I would use these to make my salads that more amazing! Its not easy being clean! Hehe I’m so excited about these clean salad dressings and condiments! One thing that makes me hesitant to eat more healthy salads is that most pre-made store bought dressings are loaded with sugar and preservatives. I need to incorporate more veggies and plants into my diet and this would help me do that by having a ready made alternative! I’m a salad junkie, or any type of mixed bowl, and with all of these dressings and marinades I see a well of possibilities! I use the salad dresseing as marinade for shrimp and chicken! I’d love to use these for salad dressings and hamburger marinaded!! I’d use them for pasta salads and on fresh -from-the-garden greens and salads too. Perfect for basting meats on the grill too. my instagram username is @blueeyeleo and I love primal kitchen!! Their dressings are delicious on salads and serve as yummy marinades for meats all year long. Tasty salads. This is fantastic! I just restarted my healthy weight journey and these could help keep me motivated by adding new flavors to try. I’d use these for my daily salads. It’s slwsys nice to have a variety so it never gets boring. Would be a GREAT way to put an exclamation point on BBQ season. OMG so many uses …. salads, marinade, dip!! Endless possibilities! Tracy! You’re our lucky winner! Emailing you now to get your mailing address. Can’t wait to make some buffalo cauliflower wings with ranch dressing! I would make buffalo cauliflower wings and dip them in the ranch! !